You’ll find over 35 different billboards in the streets of Toronto which are ironically called ‘Info Pillars’, considering the fact that they’re used to display ads and not information. So what’s an urban hacktivist to do, when the redesign of these Info Pillars have replaced bike parking and caused the cutting down of trees by the sidewalks? Occupy the pillars, that’s what! 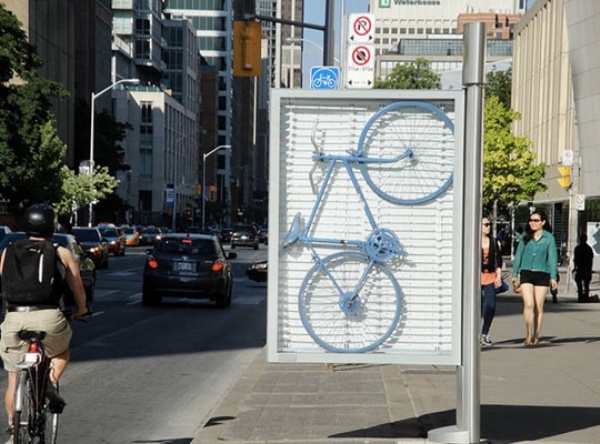 Members of the cARTographyTO creative team took down the ads that previously occupied these Info Pillars and instead replaced them with art installations, some containing actual bikes and art maps. 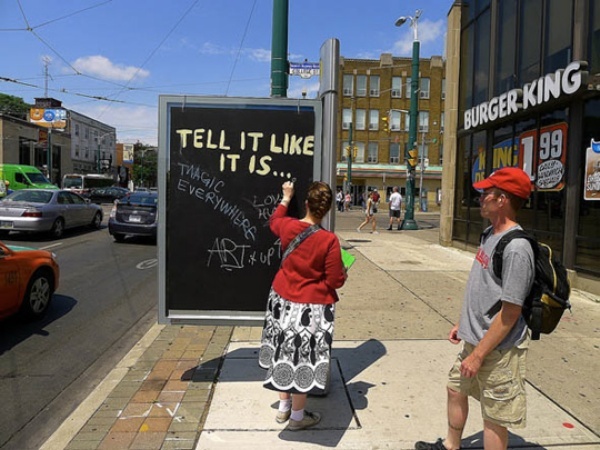 The more entertaining ones include interactive chalkboards where passersby can write down their own thoughts, opinions, or messages to the rest of Toronto. Through their efforts, cARTographyTO has managed to raise public awareness regarding the issue, encouraging the city to use them for disseminating information, as their name asserts.